Shortly after the village arrived they explained that they were sad to miss the bracken season in Japan – we showed them the hills covered in bracken shoots which everyone would be very happy for them to pick. Their sadness lifted as they began to plan how they could carry it home. 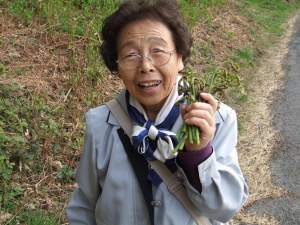 Michgo-san suggested she might move to the Lake District and set up a business exporting bracken to Japan. Very glad to see the return of George - garden buster. Of course Karen and I had worked ourselves stupid trying to get the garden in a good state before he came back and actually I am now desperate to get a few more vital things finished before the Japanese visit – to avoid the humiliation of them thinking I am a bit lazy – this farming thing is tough re peer pressure, no escaping the reality of what you have and haven’t done, (unlike art which is much more of a fudge). Despite spending 12 hour days (weekends) in heavy labour in the garden Karen still feels I need additional stomach flattening exercise in the gym – which I truly hate. I can’t stand all that waste of energy, just seeing people exercising to no useful purpose – to arguably look better. The gym is like a receptacle constantly filled with wasted energy, thousands of hours that could have been put to a useful purpose – maybe rather than calories burnt those machines could show numbers of spades lifted, walls walled, weeds weeded, nails nailed. The other interesting thing in the gym is the sight of an exercise class, entirely filled with in-shape women that clearly think they look more or less ok, like relatively good looking. Obviously these are the functional people of the area, happy enough to exercise, confident enough to wear a leotard – Karen tells me they are extremely shy in the changing room, changing in the showers and generally dicking around playing towel curtains, clogging the system up and making me wait an age, and as Karen says ‘who the f... is looking’. I cooked a whole turbot for lunch but left the bones and the head in the kitchen as is the British fashion. 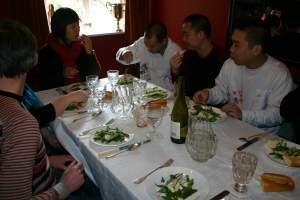 I found the artists gathered round it talking excitedly, they were worried the best bits of the dinner were going to end up in the bin –throughout lunch I could tell they were thinking of the lost delights of the cheeks, jaws and eyes (bones are a Chinese culinary obsession). Tom Trevor from Arnofini also came along and was interested in discussing Lawson Park as a venue for an art project involving growing tea, something to do with import-export colonialism, sounds a bit like international agri conceptualism, but hey people seem to like that stuff. 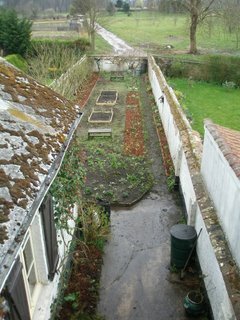 An interesting addition to our patchwork approach to land use and curation, anyone can do whatever. An interesting away day was had by myself and some local ladies recently, at Acorn Bank near Penrith on the Northern Fruit Group's Apple Grafting Workshop. 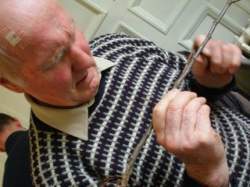 I enjoyed watching the elderly working with sharp knives and a devil-may-care attitude (see picture) as they showed us young 'uns the joys of creating apple trees from sticks, wax and plastic ribbons. My creation - 'Ashmeads Kernel' on M25 (thats a rootstock number not a motorway) - is recovering in the polytunnel. One of my formative gardening memories is the successful raising of a 'Golden Delicious' (misnomer if ever I heard one) seedling from a pip in my back garden, a tree which was still there some 15 years later when the house was sold, and though I have as yet no orchard here, I long for this most fundamental of horticultural delights. I now have the technology, if not the space, to populate it with the rare and quirky of the apple world, forms selected by the fantastically perverse Northern Fruit Group, a club dedicated to growing fruit where it doesn't want to be grown, saving rare and wild weather-proof varieties for future generations, who better bloody well be grateful, what with the number of sliced thumbs this grafting must be causing. A second trip was to the northern french town of Hesdin, where my partner's mother's garden had spent last summer turning into Sleeping Beauty's Forest, with added ground elder. 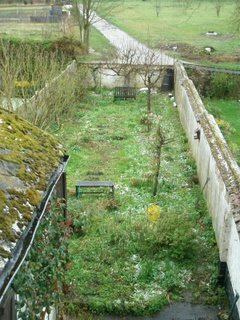 We spend 5 long, 'dur', days labouring against every perennial weed known to man and wrestling some very energetic roses into submission. The French neighbours' curtains twitched as Adam flailed behind their shared walls, swearing prolifically as another thorn wedged itself into his head, and the local garden centre offered us shares in the company due to the quantity of mulch we bought. Speaking of which, what gerden centres! Baby chicks, rat traps, log splitters, small agricultural machinery - these meccas put ours to shame, though bizarrely the only mulch you can buy baged up is large bark chips from maritime pines, rather municipal in appearance by probably very long lasting. We used them over a long border of membrane which I wrestled under the brutal roses in a desperate attempt to control the weeds.